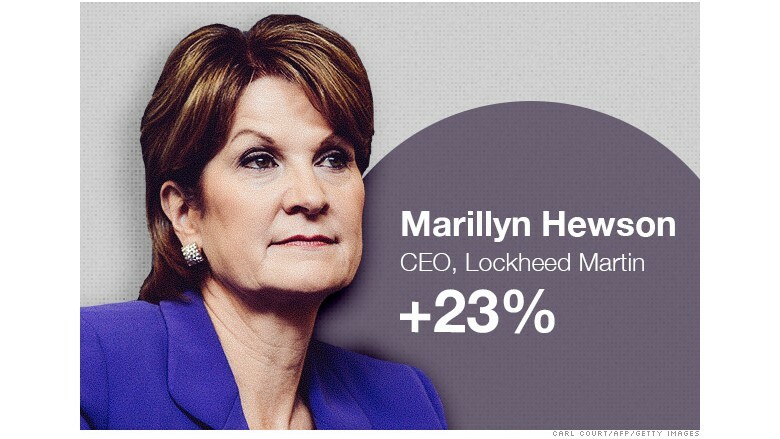 Marillyn Hewson is in charge of Lockheed Martin, the world's largest defense contractor. The company manufactures some of the meanest war machines on the planet, including F-22 raptor fighter jets, Hellfire missiles and the Fury long-distance bomber drone. It also makes tons of other innovative products like unmanned cargo helicopters, remote minehunting systems to protect boats and spacecraft to explore distant planets and asteroids. Hewson became Lockheed's (LMT) first female CEO in January 2013 after three decades at the defense giant. She promptly led Lockheed to record profits despite shrinking revenue. Related: ISIS boost for defense stocks? In the face of defense spending cutbacks in the U.S., Hewson has helped make Lockheed's share price more than double over the past two years by cutting costs and diversifying the company into cyber security and alternative energy. Lockheed recently celebrated its stock price crossing the $200 threshold for the first time ever. The company has rewarded Hewson by paying her nearly $34 million in total compensation last year, up from $25 million in 2013. Related: After Ruth Porat laves, who's Wall Street's top woman?